The urban farm case study project is a collaboration between Gordon Neighbourhood House (GNH) in the Vancouver West End and students from the LFS 350 class in Land and Food Systems of UBC. Our project focus was to produce a toolkit on how to create a community urban farm. GNH aims to collaborate with the community to create a fair, local, and sustainable food system through its programs and infrastructure. As for our CBEL project our main goal was to make recommendations for the farm to help GNH achieve its goal of providing a reliable food source for the GNH community lunch program. The UBC student group conducted research based on these questions: “What are the components of the Gordon Nelson urban farm created and operated by GNH?” and “How can this space be used more efficiently to increase food production?” A qualitative approach was used and information was gathered primarily through interviews. We arranged in-person meetings, telephone meetings, emailing questions directly and indirectly with stakeholders and members involved with GNH’s urban farm. We also took observational data by visiting the urban farm. The urban farm is a complex system that incorporates land, water, community, funding, and other components. As a key goal for the farm is to produce food for the community lunches, the relationship between the farm and the kitchen was our primary focus. Upon examination of the farm’s operational logistics, there are many barriers that need to be addressed in order to meet this goal. These barriers consisted of the seasonal restrictions on food availability, pest issues, and minimal land access to produce the types and abundance of food required. Recommendations for the GNH’s farm include building more planter beds, planting more diversified crops, ensuring high soil quality, and documenting success/challenges in the garden for reference of future improvement. 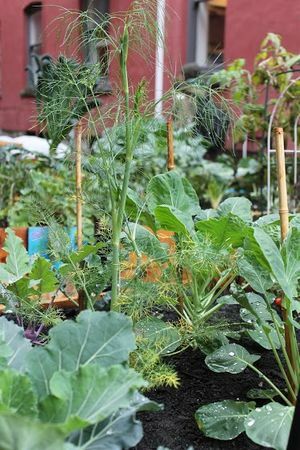 Achieving food security in the city is difficult because of diversity of diets in the population, knowledge of certain crops (growing/cooking various crops for diverse diets), access to resources to grow more food, and the short growing season. GNH has created a space to increase food security in their community, but also to provide a means to increase food citizenship and knowledge. Our research allowed us to examine the components of GNH’s urban farm and provide insight into how the farm works, and what can be done for future growth. Our team of eight dedicated members from LFS 350 at UBC was paired to work with the Gordon Neighbourhood House (GNH), a non-profit organization in the West End, which engages in community development with an emphasis on food security. Our project was a case study of the organization’s urban farm, which provides produce for the GNH community lunch program. We worked with several stakeholders at GNH to gain an understanding of their food system and the food related issues in order to conduct research of value for the organization. According to the West End Community Plan of 2012, the West End community is largely residential with a diverse population, the majority of which was between 20 and 64 years of age in 2011 (City of Vancouver, 2012). A little more than half of the families are single household at 1.5 person per family, and although around 60% of the population speak English as their first language, the West End is home to many new immigrants. To meet the needs of the diverse community GNH provides a number of resources for multiple languages and ages (Gordon Neighbourhood House Association, 2014). Programs, such as their urban farming project and community lunch program are available for all demographics. By introducing infrastructure and programs like the Urban Farm and community lunch program, the organization aims to increase community engagement as well as address food security and food literacy among community members. These two programs reflect stage 2 of evidence-based strategies to build community food security discussed by McCullum et al (2005). During this stage new infrastructure, such the GNH urban farm, are implemented which connect food access programs to local agriculture (McCullum et al., 2005). Due to the success of these programs, GNH plans to reach out to other non-profit organizations to help them develop community food spaces. To achieve this, GNH asked us to create an urban farm toolkit that provides non-profit organizations with a detailed plan on how-to create an urban farm. As a result of the organization’s goal, our group conducted research based on these questions: What are the components of the Gordon Nelson urban farm created and operated by GNH? How can space be used more efficiently to increase food production? A qualitative approach was used for this case study on the Gordon Neighbourhood House urban farm. We specifically used interviews as a method of data collection. The advantage of using a qualitative approach includes the ability to provide an in-depth analysis of the logistics of managing an urban farm and the relationship between GNH and its community. Although qualitative research is suited to this case study, it is time consuming and the credibility of our results may be questioned by other scientific professionals (Johnson & Christensen, 2006). Community based learning experiences allowed us to observe how the community addresses food security, and conduct evidence based research that addresses the food related issues, which were unique to the West End community (McCullum et. al, 2005). We created a toolkit and presented it to the GNH community at the “Urban InFARMation event”. Andrew, the food advocate at GNH, and Susanna, the lead farmer at the GNH urban farm, provided us with information on the creation of the urban farm, and on the operations and maintenance of the urban farm, respectively. Through Andrew and Susanna, we were able to get contact with other stakeholders, such as Stephanie, the landowner of the GNH Urban Farm, Peter, the chef with the GNH community lunch program, and one of the volunteers of the urban farm. Prior to our interviews, we prepared questions and modified them accordingly to ask each stakeholder. Before beginning interviews, a preview of the interview questions that were to be asked was given to the interviewee. A full list of all the questions asked in the interview process can be found in Table 1 under the Appendix. During the interview, one team member was responsible for communicating and asking questions, while another team member was responsible for typing up notes. In case any information was missed, audio was also recorded with consent from the interviewee. After the interview, one team member organized and shared the interview notes through our team’s privately shared Google Doc. To answer the first research question regarding the components of the urban farm, we read over the notes and grouped information from the interviews based on common themes to determine the key components of the urban farm. Second, to answer the research question about ways to increase the urban farm’s food production, from our data, we determined the barriers in increasing food production that were identified by the different stakeholders. From this list of barriers, we were able to research and find some recommendations that the GNH urban farm could potentially undertake to increase food production. Initially our research question was too broad and unmeasurable. We revised our research question multiple times and adapted our research collection so that we can complete the toolkit for our community partner and use the data collected to answer our research questions. We intended to only gather data from Andrew Christie, and Susanna Millar. However, after receiving feedback on our research question from Lucy, our TA (teaching assistant), we included other stakeholders as well. In analyzing the operational logistics and the relationships of the urban farm we were able to draw on key components for the operation. These components were then used to build the framework for our toolkit, which is attached in the appendix. As the primary goal for the farm, in terms of production, is to produce food for the GNH community lunch program, it is the relationship between the farm and the kitchen that we have addressed in evaluating the efficacy of the farm. In doing so it is evident that there are many barriers which prevent the organization from reaching this goal. The first barrier is the incompatibility between the produce selection by the kitchen and the seasonal and space restrictions within the farm. Peter Nguyen, the chef at GNH, states that he would like to see more high calorie crops such as root vegetables and fruit (personal communication, November 2014). Crop selection, however, is restricted by space limitations and seasonality (S. Miller, personal communication, October 2014). 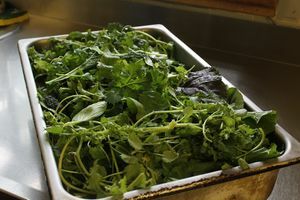 Seasonality is particularly significant in the off-season when winter greens are the prominent crop choice. The limited space from the farm and the planter box-style model imposes further limitations as they may not meet the space requirements that these crops often require (S. Miller, personal communication, October 2014). The lack of space and labour also poses a barrier with respect to the quantity of food that can be produced. Currently the kitchen intends to include one item from the farm for each meal (S. Miller, personal communication, October 2014). While this contribution is significant, it is much lower than the organization’s long-term goal of providing a completely self-reliant food source for the community lunches. Finally, pest problems have also been a factor in reduced yields due to poor soil quality and limited experience with the space (S. Miller, personal communication, October 2014). At the beginning, our project seemed too complex to complete within our allotted time. But the interviews with stakeholders helped us to conceptualize the GNH farm system. No one stakeholder knew all the components of the farm, so interviewing multiple individuals and piecing together information was necessary to understand the timeline and operation of the farm. For example, the landowner of Gordon Nelson clarified how the farm space came to be; whereas the Lead Farmer mapped out how the farm is currently operating in the space. In addition to information, stakeholders provided personal stories on the importance of the farm to them. In relation to the LFS 350 outcomes, the GNH farm incorporates multiple knowledge and expertise frameworks, which we witnessed through our interviews. This experiential process allowed us to create a well-informed, multi-perspective document that is user-friendly. Our findings show us that the urban farm is producing food for GNH and neighbours in the community. Leafy greens and herbs grow well in the garden space; consequently, these are the crops incorporated in the community lunches. We have observed that other crops such as tomatoes, squash, and brassicas are able to grow in the gardens but not in great quantities so these crops are not often used in community lunches. There is potential for higher yields and greater diversity of crops. Limitations exist in respect to our findings and methods. Considering our time and ability, we were only able to conduct qualitative research, such as interviews and observations. In different circumstances, using quantitative measures to observe food production and space use could provide further insight into the farm operation. There is collective strength in the identification of multiple variables (Cresswell, 2003). By understanding the context of the GNH farm, we felt more comfortable analyzing how this farm in particular can increase their food production. The people and landscape of the farm influence learning- knowledge then is place-based (Raffles, 2002). We recognize that GNH has to work within their means; plenty of resources, time, and labour are required to create a highly efficient urban farm space. Currently, they can only afford to have one paid employee for the farm. In Vancouver, GNH has the reality of a limited growing season. With the exception of a few crops, year-round crop production is not possible outdoors. The infrastructure required for over-winter crop growth requires additional time and resources. Incorporating diversity in diets, knowledge of crops (growing, cooking, etc. ), access to resources, and various cultures is a challenge for GNH in terms of maximum efficient food production. The urban farm aims to incorporate any/all community members; therefore, while increasing food production is important, developing a sense of community needs to be done within an ‘ethic of care’ (DuPuis & Goodman, 2005). Despite the limitations, GNH urban farm is working towards a positive food future in their community. They have increased accessibility of healthy, locally grown produce and accessibility of food-related resources. To achieve food security and sustainability, it is crucial to overcome the ‘distancing’ and disconnection that characterizes the current global food system (Kneen, 1993). The farm space has become a catalyst in starting conversations around food consumption. The creative, dynamic, and thoughtful creation of this community farm has allowed people to connect over food, for example the Lead Farmer said, “I hand people fresh garden vegetables through their windows, it’s great!” (personal communication, October 2014). Overall, the GNH urban farm breaks the narrative that people who live in the city are disconnected and uninterested in the processes their food goes through. Part of this report’s research question specifically looked at recommendations for GNH’s urban farm with regards to space and ways to enhance the use of space in order to maximize food production to contribute to an increase in food security for the GNH community. Aside from what is previously discussed in the report, there are other recommendations that GNH could potentially use in order to see an increase in food security, community involvement and building. Upon meeting and discussing with GNH’s Lead Farmer, there was mention of a university collaboration that recruited engineering students to install an irrigation system (personal communication, October 2014). This partnership could be repeated with other university students of different disciplines that coincide with aspects of the urban farm that need assistance. The Lead Farmer mentioned how healthy and fertile soil is key for success in the beginning stages of an urban farm. Collaborations with soil science students can aid in the assessment and preparation of soil beds of future urban farms. This collaboration would also provide the university students with hands on experience and the opportunity to participate in a community movement towards food security, a benefit that we experienced ourselves. Our last recommendation focuses on partnerships with other groups in the community. Since GNH is a non-profit organization the do not sell their produce, it is used for their Community Lunch Program. The overarching goal for the Urban Farm is to provide all the produce for their Community Lunches. Although space is a limiting factor for growing vegetables like squash and potatoes, GNH could create a system with other community farms where farms can exchange their vegetables for vegetables they are not growing. This will increase the variety of vegetables for their Community Lunches while creating a network of community farms. GNH has managed to create a space to not only increase food security in the neighbourhood but to also provide a means to increase food citizenship within the community. Our research allowed us to examine the components of GNH’s urban farm, understand the necessities for starting an urban farm, and realize the flexibility required to maintain an urban farm. We hope that our urban farm toolkit can inspire other organizations to take action and challenge food insecurity in their community. What is the title and description of your position (if another organization were to start an urban farm project so that responsibilities can be identified)? What were the challenges that you came across during the initial project start up? How do you find land? Who do you contact to find land? What paperwork regarding land, funding etc… needs to be filled out? Where should one get tools, seeds, and other materials? How should one ask for donations? How does one create a water supply when there is no source nearby? Why did you choose to collaborate with Gordon Neighbourhood House? Why did your organization choose to give land for the Urban Farm project? 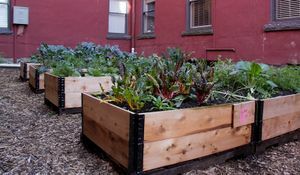 Why did your organization choose Gordon Neighbourhood House as a partner for this Urban Farm project? Did you/ How did you reach out to Gordon Neighbourhood House? What does your company hope to get out of this project? What are the costs and benefits that you had to consider before choosing to fund this project? Where did you get the idea of transforming the courtyard into an urban farm? How do you incorporate the fresh produce from GNH Urban Farm into your community lunch cooking? What different kinds of produce from the Urban Farm do you wish to see added into your cooking? How does receiving fresh produce from the Urban Farm change your method of cooking meals? How did you learn about the Urban Farm? Why did you choose to volunteer at the Urban Farm? Johnson, B. & Christensen, L. (2006). Table 14.2 Strengths and Weaknesses of Qualitative Research. Retrieved from http://www.southalabama.edu/coe/bset/johnson/oh_master/Ch14/Tab14-02.pdf. Kneen, B. (1993). From land to mouth: understanding the food system. NC Press. Raffles H. (2002). Intimate Knowledge. International Social Science Journal. 54(3): 325-335. This page was last edited on 10 December 2014, at 19:00.